An international community on a mission of peace and enlightenment. The Modern Mystery School (MMS), offers advanced spiritual teachings and metaphysical classes on the tools and techniques passed down by an oral tradition, from teacher to student, since ancient times. This organization has a documented unbroken lineage of over 3,000 years, back to King Salomon the Wise. King Salomon is a central figure from the Book of Kings in the Bible. He was a radical thinker for his day, establishing the first global meeting of spiritual leaders and healers, establishing a universal system of enlightenment for all people regardless of race, gender or belief system. This planted the seeds of the amazing potential we can see around us in the world today. Initiates of this system including Leonardo Da Vinci, Sir Isaac Newton, Carl Jung and David Bowie, have been working in large and small ways, in the public eye and behind the scenes, to ensure that humanity can prosper and achieve world peace. Today, the MMS supports us as we to come together to heal and empower ourselves, our communities, and set forward into self-mastery in this lifetime. Each student is invited to join us on a path of self-discovery and spiritual progression. We do not show you the way, but instead, remind you how to find that way for yourself. The MMS trains and certifies a worldwide network of independent “Light Centers,” where the lineage takes on new members through initiation. These centers offer a variety of spiritual classes, healing sessions, and activations. The international headquarters is located in Tokyo, where the founder and lineage holder, Gudni Gudnason, resides with his wife Eiko. Toronto is the North American headquarters for the MMS, and is where the region’s Healers, Guides and Ritual Masters receive annual certification and more advanced training. 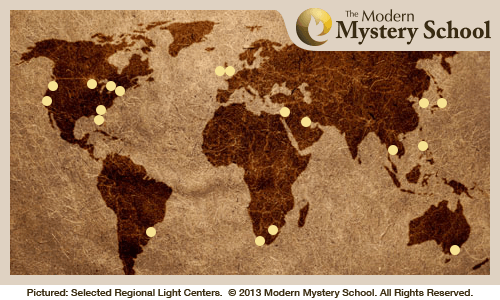 In Los Angeles, the Mysterium Center in Mar Vista is the local Chapter of the Modern Mystery School. It has an open-minded community with authentic mystery school lineage that provides high-quality training for individuals and leaders to access higher consciousness to have higher impact to a greater level. Through a path of activation, healing and initiation, the Mysterium Center supports whole-being transformation. By handing down ancient tools and knowledge, the Mysterium Center brings people from pain to passion in order to live an extraordinary life. The first step on this path is to schedule a Life Activation Session with one of the certified practitioners. This 90-120 minute session includes a balancing of your energy systems followed by the Life Activation, an ancient ceremonial process to bring more Spiritual Light and energy into your entire being, aligning recipients more with their true purpose, and opening the potential for exceptional progress and growth through service to humanity.